The northern cave rat is a semi-aquatic mammal about the size of a wolf. It has a large flat tail for swimming and powerful incissors for biting through tree roots, as it lives underground and near water. They are social animals, like wolves, so they have similarly been approached by the more determined goblins. The dragoons are veteran lancers, and have continued to scavenge better armor. 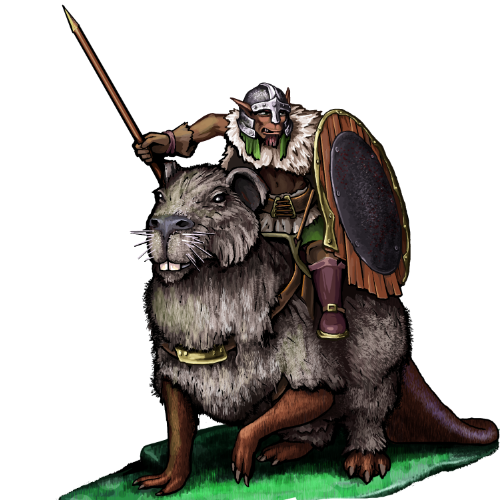 Their relationship with the rat has paid dividends for the rodent, for the goblins practice their spearing by hunting smaller animals, and while the rats will eat anything, they benefit from the richer diet of a predator.